Epoxy Flooring - Liquid Stone Inc.
As a leading Concrete Flooring Company, LSI provides our clients with the required floor coating system for your warehouse, office, lobby, home, garage, mechanical room, manufacturing plant, mill, pharmaceutical lab, restaurant, institution, retail and commercial space. Epoxy is exceptionally durable and versatile with many colours and patterns, making it an exceptional commercial and retail flooring solution. High foot traffic locations like shopping centers, hotels, and offices require wear-resistant flooring, epoxy flooring is a perfect solution. Epoxy is stain, scuff, and scratch-resistant and can be topped with a slip-resistant surface for safety. 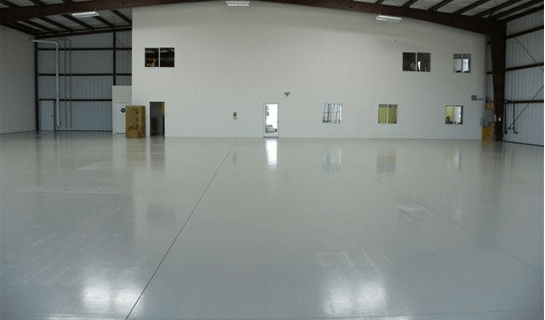 Due to machinery, spill and stain potential and foot traffic, the only realistic industrial flooring options are concrete or epoxy. Concrete is hard, slippery, bland looking, stains easily, absorbs moisture, and is porous. Epoxy is softer, slip-resistant, glossy and attractive, resistant to stains, sealed from moisture and easy to clean. Epoxy self-leveling creates a smooth surface, important to industrial settings. Residential epoxy is suitable for high-end modern homes where the glossy coating is required and for heavy traffic households needing extra durability. Color options can easily blend with existing décor and its moisture resistant properties make epoxy an exceptional kitchen, bathroom, pool deck, exterior patio or balcony solution.